It is time to decentralize Airbnb & loyalty using blockchain technology, tokens & cryptocurrencies like Bitcoin & Ethereum to bring about a new age in travel. Cryptocurrency is all the rage right now. The promise of a brighter future with frictionless global payments and “decentralised applications” has skyrocketed the price of popular digital currencies, including Bitcoin, Ethereum, Ripple & more. As of June 2017, Ethereum (a popular digital currency similar to Bitcoin) has seen a whopping 2000% + price increase over the last year! Although the current cryptocurrency markets have taken a dip over the past few weeks, if blockchain technology proves to be a “game-changer”, I imagine this to be a minor blip in the cryptocurrency’s meteoric rise. What’s a blockchain & why might it be a game-changer? Blockchain technology is decentralized by design. It’s a global network of computers managing a single ledger/database by storing blocks of information that are identical on every single computer. So why is blockchain technology a game-changer? Blockchains empower people – by the people, for the people! They eliminate the need for middlemen & data silos across thousands of platforms selling your personal details – Users are in control of their own information and transactions. A global platform for our transactions & dealings is something very big. This clearly has huge implications and has potential to change the world. I’m going to focus on the bottom two and explore how blockchain technology could revolutionise marketplaces like Airbnb & loyalty programs through decentralization. 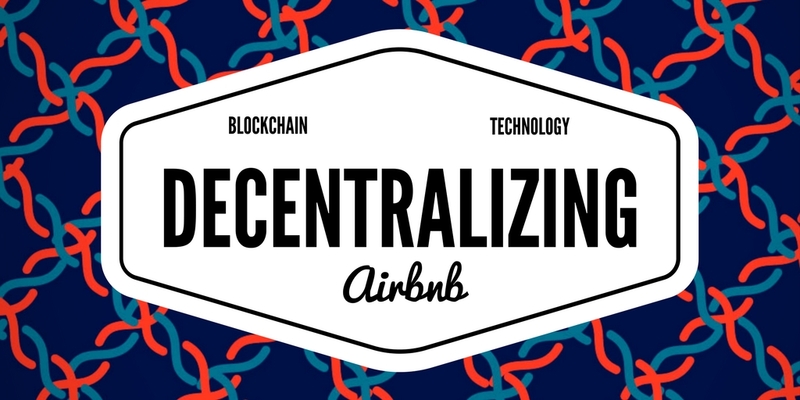 What’s a decentralized application & does Airbnb need to be decentralized? A new type of software program designed to exist on the Internet in a way that is not controlled by any single entity. Where Bitcoin is a decentralized value exchange, a decentralized application aims to achieve functionality beyond transactions that exchange value. you can buy Bitcoin T-Shirts now!). The idea of a decentralized app is to extend this functionality to any application which involves more than just a financial transaction. As mentioned above, this includes things like insurance, cloud storage, peer-to-peer retail & marketplaces, loyalty schemes, supply-chain management, security systems etc. Not every application needs to be decentralized, In fact, some work better without it. Blockchains are often slow and clunky – imagine trying to keep a history of every transaction ever, constantly updated & in sync across thousands, if not millions of computers. So when should an application be decentralized? Should Airbnb & similar marketplaces be decentralized? Yes – I believe so. Airbnb currently sits in between a homeowner and a guest. They provide an extremely well-designed interface, which allows millions of guests to find & book homeowners homes. In return, they charge a guest service fee (up to 15%) and take a commission off the homeowner (up to 5%). Additionally, they charge a transaction fee (up to 3%) for every booking. Fees add up, which is why I often see homeowners marking up their prices on marketplaces. For example, to offset her fees, Jane might raise her prices from $100 p/night to $105 p/night. In total, John could potentially pay $1243.5 for a 10 night stay instead of $1000 if he had booked direct! That’s a $243.5 saving! It’s worth noting, booking direct is also likely to incur a similar credit card fee – however, cryptocurrency promises to dramatically reduce global transaction fees (if not eliminate them with new blockchain technologies like Tangle). In all fairness, Airbnb does provide more value than just connecting two parties… The biggest one, of course, is bookings! They generate an enormous volume of traffic which is converted into bookings. There are thousands of Airbnb alternatives who charge small fees but they don’t generate bookings. Because of this, Airbnb & similar companies like HomeAway (recently bought by Expedia for over $3bn), TripAdvisor and Booking.com control over 90% of all bookings. This monopoly allows them to increase fees & buy out any competition who threatens them. Additionally, Homeowners & managers are at the mercy of continually changing terms and structure – Like Airbnb’s recent push toward instant bookings (hosts can’t screen who’s staying in their home) or HomeAway’s removal of any direct contact. Businesses are reluctantly dependent on marketplaces, and therefore have to conform to platform changes. I’ve seen firsthand how thousands of property managers lost, in some cases, over half of their yearly revenue, simply because HomeAway changed their search algorithm in favour of properties which generated higher profits or the published reasoning: “this is what guests want”. Never put all your eggs in one shareholder-centric profit-driven basket! In the eyes of most guests, Airbnb is trustworthy, especially with verified accounts, insurance policies & peer-to-peer reviews to ensure guests & hosts can trust one another. However, it’s worth noting Airbnb’s $1m host guarantee appears to be more marketing than insurance. Peer-to-peer reviews tend to be falsely positive because individuals are aware they themselves are being reviewed. And with the recent increase in online scammers, trust is wavering. It’s no wonder Airbnb have recently bought a background checking company. These are important & challenging issues but a decentralized application running smart contracts to manage these things autonomously is a potential solution. One issue that’s always haunted the home-rental industry is loyalty. Businesses are usually made up of 1-100 properties and tend to be in one destination. Travellers love exploring, which makes it difficult to gain loyalty and repeat businesses. Large hotel chains & global property managers solve this problem with their enormous number of units. Without a scheme, Airbnb drives incredible user loyalty. Why? Because they have a huge inventory of unique properties and provide an amazing guest experience from start to finish. But Airbnb’s loyalty does not transcend their platform. Users can’t book a home and receive loyalty points which can be spent on other homes, flights, attractions, taxis and more – or simply to cash in. Users can’t gain loyalty points which will go up in value over time based on how many people use the system – Effectively rewarding users for USING the platform! Loyalty programs are stretched across a plethora of industries, including travel, retail & finance. According to the 2015 Colloquy Loyalty Census, the average US household belongs to 29 different loyalty schemes! Managing the complexity of multiple point systems, redemption options & tedious exchanges to partner programs. Every loyalty scheme is vulnerable to disruption, however, travel companies are probably most at risk because they tend to be the most complex with multiple point systems & internal currencies. Most retailers run simple discounts like cash back or a single currency/points which can be spent across a range of outlets. However, travel companies offer loyalty points which differ depending on factors in the journey (flights/air miles, car rentals, hotels, restaurants etc) – which leads to a fragmented collection of points. According to the Havard Business Review, they estimate between 10%-20% are points are never redeemed. Additionally, many loyalty schemes ensure infrequent users never accumulate enough points to earn a meaningful reward. The sheer magnitude of LPs coupled with recent changes in accounting rules have turned these liabilities into significant balance sheet items—for instance, at the end of 2015, they amounted to roughly $3.9B for Delta Airlines and $2.6B for Marriott International, or 10% and 25% of their respective total liabilities. A blockchain based solution which allows customers to instantly redeem & exchange points between multiple partners on a single platform. The beauty is, with a single wallet to store points, customers are free to pick & choose loyalty schemes as they please, without the laborious task of researching options, regulations & limitations on redemption & exchange rules. There could also be a library of loyalty schemes for different companies, each with a transparent list of places to either redeem or exchange points. Customers could simply tick where/how they want to exchange/redeem their points, and it happens instantly. Customers could even exchange loyalty amongst friends, family and the general public! Adopting a blockchain based loyalty system would allow companies to seamlessly add partnerships, without increasing the complexity of their program. It could even be as simple as requesting a partnership through an online platform and the other company just accepting it. A larger network of partners could create an influx of new business from consumers normally outside their scope. Travel companies are already paying billions of dollars every year to online travel agents like Booking.com, Expedia, HomeAway, Airbnb, TripAdvisor etc. The reason OTAs are successful is that they drive huge loyalty & repeat business. However, if smaller businesses banded together and offered a loyalty scheme which saves both sides of the transaction considerable money – we may move toward a true peer-to-peer model. Early adopters could benefit considerably because initially a limited supply of points could be created on the blockchain. Further points could be issued carefully when transactions are made. With a limited supply and steady rate of inflation, early adopters (including customers) who own points, will have their loyalty points portfolio increase in monetary value as more people adopt the system. Just like we’ve seen in Bitcoin & Ethereum. Over time, the system should be designed to stabilise in price – early adopters will be rewarded and the majority can enjoy a seamless & money-saving system. How to make Airbnb decentralized & where does loyalty fit in? It must be completely open-source, operate autonomously, and with no entity controlling the token majority. Changes to the application must be adopted by consensus. In order to decentralize Airbnb, everything must actually be decentralized – meaning there’s single source of power or control. With no source of power or control, there can’t be a single authority controlling the system. Therefore, it must run autonomously. Everything from finding and booking a property to payments, reviews & post departure sequences must be handled through something called smart contracts. Smart contracts contain code functions and can interact with other contracts, make decisions, store data, and send tokens/money to others. Essentially contracts written in code and executed without human input. They ensure the whole system functions autonomously – It’s vital smart contracts don’t contain bugs or unexpected edge cases. Like mentioned above, the codebase must be public and allow contributors. The project is built for the people, by the people. Obviously, it’s important to have a delegated team help drive the project forward but every line of code can be scrutinized by anyone at anytime. Once the project is launched, making changes to the codebase should require a voting system, where if x% agree, the software is automatically updated across the network. Data must be cryptographically stored in a distributed blockchain to avoid central failure points & security breaches. It’s essential for data to be secure because victims of a scammers & hackers can’t reclaim their losses in an autonomous organization, therefore security and immutability are crucial. However, storing all data on a distributed blockchain database across thousands of nodes is extremely inefficient. Airbnb’s lightning fast searches with big fancy images would be impossible to replicate on a blockchain. Therefore, it’s important to note not all data should be stored on the blockchain – only items which are sensitive & need to be immutable like transactions, identities, reviews, core property information etc. Items like property descriptions, photos & indexes for searching change regularly and should not be stored within the blockchain. Perhaps people could build more centralised applications built on a secondary layer above the blockchain which can reproduce Airbnb’s speed and design, acting like a window into the system – but keeping its core USP the same. Every application should have a token/coin – and a decentralized Airbnb is no different. Let’s call this hypothetical token “Air”. It’s also worth noting, Air would be publicly traded and have a real world value. It could be traded for Bitcoin, which can be traded for fiat currency. Early adopters are likely to reap higher rewards as the platform grows and the market cap increases – effectively encouraging people to join early (with no bookings) and overcome the chicken & egg problem. How would you launch a decentralized Airbnb (“Dairbnb”)? First, let’s refer to our hypothetical platform as “Dairbnb”. Now, in order to succeed in building & launching Dairbnb, we need to overcome a few barriers to success. The first & most important barrier to creating Dairbnb is technology. Blockchain technology is something akin to the early days of the internet. Technology is immature and many industry experts agree. Ethereum (a platform to build decentralize apps on, like Dairbnb) is currently experiencing huge network delays from just a few applications. Imagine having thousands of applications with millions of users? With the technology today, it’s not going to happen. The answer isn’t far around the corner. Platforms like Ethereum and Bitcoin are planning to roll out new software updates across the network to dramatically improve transaction speeds. When an update is so large, it’s called a “hard fork” because network supporters that don’t update the software will cause the currency to split into two new ones. This is partially the reason Ethereum currently has two branches “Ethereum Classic” & “Ethereum”. A hard fork short term can be seen as a bad thing amongst speculators and investors because the currency’s value will drop if the hard fork causes a split. However, long term, the improved software is likely to massively increase value again. Finally, there are new platforms being developed as we speak, like EOS, a platform/operating system on a blockchain which promises incredible transaction speeds, super low fees and existing tools to build on top of (like Windows & MacOS). This makes it super easy for developers to deploy new applications with less code. Cryptography, blockchain & digital currencies are new and evolving technologies. They’re like a 7-year-old who doesn’t know what they want to be when they’re older. This is a major barrier to mass adoption of blockchain technologies. In order for people to start using Dairbnb over Airbnb, the application needs to be utterly seamless. Users can’t be expected to deal with the current complexity that comes with cryptocurrencies, like maintaining a node (a computer connected to the network, supporting it through validation and relaying of transactions while receiving a copy of the full blockchain itself). Easy to say, hard to execute but I’m sure it will happen naturally over time. It’s like the early days of the internet – geeks & hackers tinker with new technology – No one is sure where it’s going but until they do, concepts are raw and terms are continually evolving. A bridge that allows you to visit the distributed web of tomorrow in your browser today. It allows you to run Ethereum dApps right in your browser without running a full Ethereum node. This means you can access decentralized applications, which are built on the Ethereum blockchain, with a simple chrome extension. Before MetaMask, users were required to run a full node (with the entire blockchain database on their computers)! Dairbnb could be built on Ethereum (Note, you can also buy Ethereum T-Shirts if you want to support the project), however, like mentioned above, the technology isn’t scalable… just yet. In the future, users won’t need to know underlying concepts. They’ll just connect and go. Finally, as the industry grows, I’m sure education and learning will too. I’ve saved the final barrier and solution to last because I find it the most interesting. Airbnb is worth in excess of $31 billion. They rank in the top few Google search results across millions of key terms, they have the scale to muscle small businesses out of any pay per click advertising and spend tens of millions on marketing every year. So how on earth will Dairbnb, a hypothetical open-source autonomous decentralized application have the marketing reach, budget and execution to compete with Airbnb – even when Dairbnb is smoother, cheaper & more transparent. Dairbnb will need a team behind it. They won’t own it and they won’t make money directly from it but their financial incentive comes from owning “Air” in the early days (our token example). As the platform grows, Air will surge and the team can sell at a hugely increased price. This gives the core team motivation to continually improve the platform for its users, without misaligned incentives – Because there are no profit-hungry shareholders! ICOs (initial coin offerings) are potentially the craziest things happening in the cryptocurrency space right now. When a new application (like Dairbnb) and coin (like Air) is created, often the developers mine a large percentage of the total coins in existence pre-launch. When the digital currency is launched, they usually offer their pre-mined coins at a discounted price to early adopters. Investors buy these initial coins in the belief that the project will provide real value to consumers one day so they can sell their coins at a hugely inflated price – making a tidy profit. Recently, there has been some enormous ICOs, for example, Bancor (a liquidity mechanism for tokens) raised $153 millions worth of Ether in 3 hours! EOS (an operating system for blockchain), as of July the 4th 2017 has raised $185m and are on track to raise between $1bn – $5bn over the coming year! These numbers are just ridiculous – the speculation and hype around ICOs and cryptocurrencies are insane. With negotiable fees and no regulation, the legalities of ICOs are yet to be determined. However, this presents a unique opportunity for a team to raise a tremendous sum of money to fund the development and marketing of Dairbnb to compete with Airbnb. Fees sound scary but in reality, for the project to run smoothly and operate into the long-term, there probably needs regular compensation for developers and network supports. Therefore, like Airbnb, Dairbnb will also take fees, however, they will be orders of magnitude smaller. So much so, users won’t consider them whilst booking holidays. If you’re still here, I’m flattered but to those who have already clicked away – I don’t blame you. These concepts are totally new and at appear unintuitive at first. I have spent many hours reading, watching & listening to experts – and I still have hundreds of unanswered questions. There are a few grey areas as to how a decentralized Airbnb would run and if it would ever be popular. Airbnb has the advantage of moving quickly and innovating with cool ideas like Trips. As they move into the entire travel experience, are decentralized ideas just pipedreams? I do not believe any new listing website has the potential to replace big players like Airbnb, HomeAway & Booking.com. Greater innovations are required because there’s no point in re-inventing the wheel. Airbnb had a fresh take on the industry and now it’s transformed forever. Will decentralizing the industry and thousands of similar marketplace models like Uber be the next jump in innovation?